BEIRUT -- Muslim militants pushed forward in their offensive on a major military air base in eastern Syria Friday capturing a nearby village in an attempt to take one of President Bashar Assad's last outposts in a province that borders Iraq, activists said. The Britain-based Syrian Observatory for Human Rights and the Local Coordination Committees say clashes continued for the second day around the air base just outside the contested eastern city of Deir el-Zour. The Observatory said fighters from the Islamic State of Iraq and Syria (ISIS) captured the strategic village of Jafra reaching the fence of the sprawling air base. The Observatory, which has a network of activists around the country, said the fighting that started with an ISIS offensive early Thursday has killed 30 government troops and 27 jihadi fighters. How did US jets end up in Iran to be used against ISIS? The key military air base gives government warplanes a hub from which to bomb ISIS-held cities and towns across much of eastern Syria. For ISIS, capturing the airport would eliminate the main pocket of resistance in the area and provide a major morale and propaganda boost after a string of setbacks in recent weeks. Friday's fighting in Deir el-Zour came as a Sunni militant commander in Syria who has pledged allegiance to ISIS threatened to "retaliate" against Lebanese Shiites and families of Lebanese soldiers over the arrest of his wife and two children in Lebanon, according to a new militant posting. The threat underscores how tiny Lebanon, with its own Sunni-Shiite sectarian tensions and divisions over neighboring Syria's civil war, is increasingly being pulled into the battle with ISIS, which has captured much of Syria and Iraq. The video statement by the Sunni militant, Abu Ali al-Shishani - whose real name is Anas Sharkas, according to Lebanese authorities - also said that mediation efforts for the release of more than 20 Lebanese soldiers held captive since August by ISIS and al Qaeda-linked militants in Syria have stopped, until his family is freed. It was unclear from the statement, released late Thursday, what role al-Shishani has played so far in the mediation efforts, which are led by Qatar, a traditional Mideast mediator. The arrest of al-Shishani's family members was announced by authorities in Beirut earlier this week, shortly after they announced they are holding a wife and child of ISIS' leader, Abu Bakr al-Baghdadi. Iraqi officials have disputed that announcement, saying neither of al-Baghdadi's two wives has been detained. In his threat, al-Shishani says Shiite women and children, along with families of Lebanese soldiers will be "legitimate targets" for his militants. 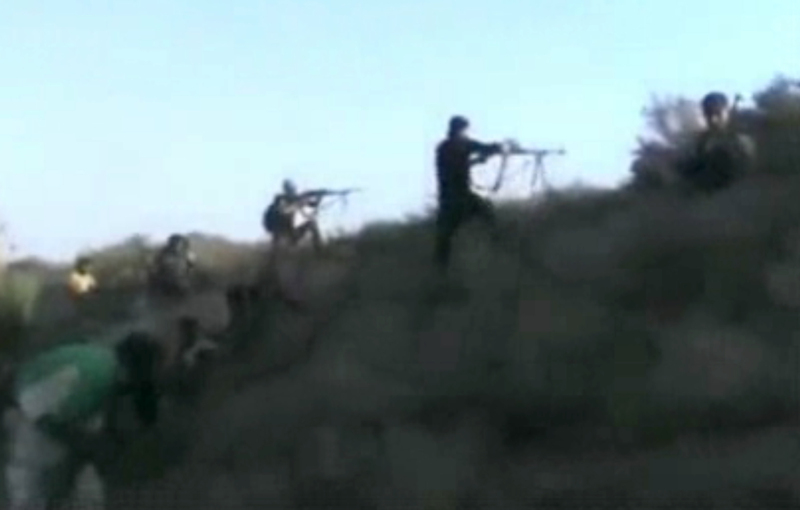 Lebanon's Shiite Hezbollah group has sent fighters to back Assad's forces. In the video, al-Shishani, who is shown seated in front of a black flag of ISIS, flanked by two masked gunmen, says one of his detained children is four and the other is still a baby. The authenticity of al-Shishani's video posting could not be independently verified but it appeared on websites commonly used by militants. Meanwhile, President Obama was scheduled to meet with Jordan's King Abdullah II at the White House Friday to discuss the fight against ISIS. The leader said he believes to fight ISIS, the Muslim world must come together. "This is a Muslim problem," he said. "We need to take ownership of this. We need to stand up and say what is right and what is wrong." He told CBS News' Charlie Rose this is a fight between good and evil and Muslims must take a stand to defeat the extremists. Abdullah believes the threat posed by ISIS is "a third world war by other means."